Inder Loves Folk Art: Meanwhile, back at the urban homestead. While I was plotting ways to get out of work early on this glitteringly blue, downright hot spring day, a wandering swarm of bees was taking over our back garden! Steve bloggeth (I'm sorry, bloogeth). Since I couldn't leave work, I blabbed to my coworkers and emailed half my friends to share our exciting news! 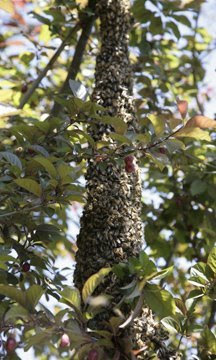 We have a swarm of bees, everyone! Reactions varied from "I think there's a special kind of Raid for bees" to "You'd look really good in one of those beekeeper outfits" to "I want some honey!" But in the end, I missed the show - the bees moved on to a neighbor's house before I got home. Further evidence that having a job means you miss out on everything interesting.